A Return to Growing Capital Outlays on Water and Wastewater Infrastructure? The year 2010 marked the start of an unusual period in the water sector. 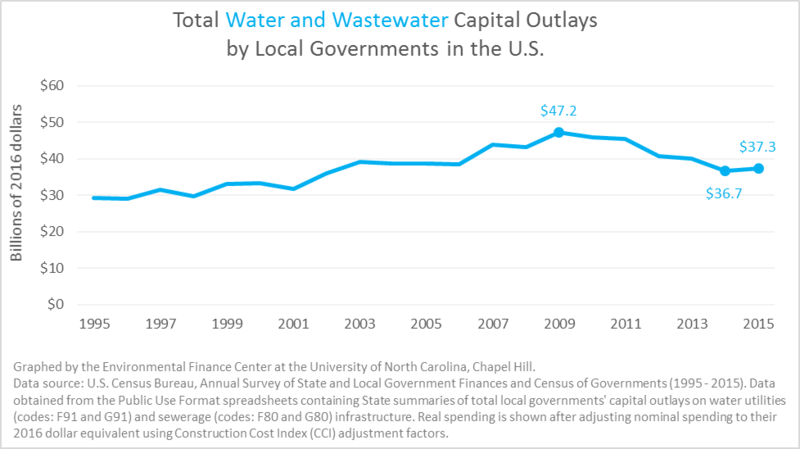 For five years running, total capital outlays by local governments in the United States on water and wastewater infrastructure declined year after year. This period coincides with the Great Recession and towards the end of spending under the American Recovery and Reinvestment Act (ARRA). 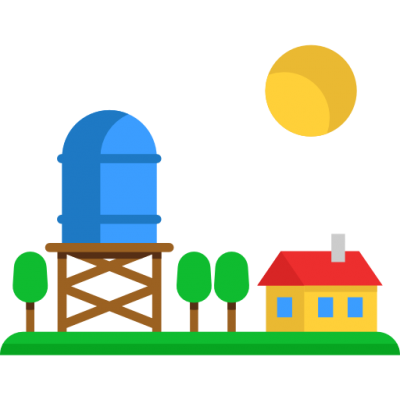 Yet infrastructure continued to age, and construction costs continued to rise at about 2.6 percent per year during that period. Have we finally come across a sign that capital expenditures on water and wastewater infrastructure may be growing again? At the end of 2016, the Environmental Finance Center at the University of North Carolina at Chapel Hill began working on a project to assist the Water Design-Build Council and its contractor, Rubin Mallows Worldwide, assess the potential market of design-build projects in the water sector. The results of this assessment was recently published by the Water Design-Build Council in a report titled 2017 State of the Demand for Design-Build Delivery in the Water/Wastewater Sector. To accomplish this task, the EFC at UNC studied trends in capital outlays captured by the U.S. Census Bureau in their Annual Surveys of State and Local Government Finances, and in their quinquennial Census of Government Finance. These surveys include data on local, state, and federal governments’ and tribes’ revenues and expenditures for a wide range of services, including water utilities and wastewater (defined as “sewerage” in the surveys). Much of this data has already been summarized in an earlier blog post describing trends in expenditures since 1956. Analyzing the local government expenditure data, adjusting to 2016 dollars using the Construction Cost Index, reveals that in 2015 there was, finally, an uptick in capital outlays on water and wastewater infrastructure. As shown in the graph below, between 2009 and 2014, capital outlays (adjusted to 2016 dollars) declined every single year, to the tune of more than 22 percent reduction by 2014. This was one of the longest periods of declining local government capital outlays in this sector since the 1950s. Unlike a similar decline in the 1970s, federal government spending on capital infrastructure did not increase during this time, thus resulting in an overall decline in capital expenditure in the sector. However, in 2015, local governments spent the equivalent of $37.3 billion on water and wastewater capital outlays compared to $36.7 billion in 2014. The increase is modest—only a 1.6 percent increase in real dollars—but could be an early indication that local governments are increasing their spending on capital projects once again. The U.S. Census Bureau will publish data on 2016 local government expenditures in late 2018, which will be useful in continuing to track this trend. For the Water Design-Build Council report, we forecasted a general increase in capital outlays by all water and wastewater utilities (including those not owned by local governments) starting in 2015, as shown in the graph below, published in the WDBC report. 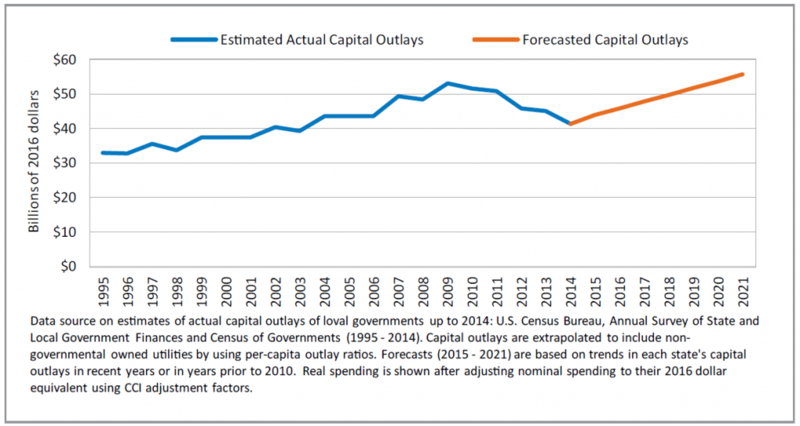 Our national forecast was more aggressive than what actually occurred among local governments in 2015, but the reverse in the downward trend of capital outlays in 2015 is significant. This may be a signal that local governments are resuming or accelerating spending on capital projects after a hiatus during the aftermath of the Great Recession. Or the increase in 2015’s outlays might be an anomaly in a continuing downward long-term trend. The most important point, though, is not whether capital outlays are growing or shrinking, but whether utilities are spending adequately to ensure that their assets are well-maintained and their systems continue to operate at a high level. In a national survey of local government utility managers, conducted in 2014 with the assistance of the International City/County Management Association, we found that 45 percent of 1,349 utility managers indicated that the water/wastewater rates presented to their governing boards for approval would not be sufficient to cover basic utility obligations and most capital needs. These utilities would therefore not have the means to ensure adequate spending on capital projects unless they identify alternative sources to pay for them. Shadi Eskaf joined the Environmental Finance Center in 2004 and is a Senior Project Director. Shadi works on environmental finance projects in local, statewide and regional settings, conducting research on water and wastewater utility finance and rates, water use, infrastructure capital needs and funding, and water systems collaboration and regionalization.